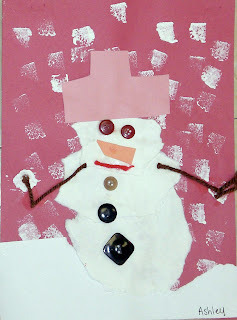 Kindergarten students created snowmen by sponge painting a background with white paint and then tearing a 9x12 in piece of white paper at the bottom to create the snow. Then, students used the remainder of the white paper to tear out 3 circles for the snowmen. Finally, students added buttons, construction paper hats, mouths, noses, and arms out of brown yarn to finish their snowmen.